Taipei’s posh Xinyi District is getting ready for the lantern festival. The festival falls on the fifteenth day of the Lunar New Year. For the main lantern, the illumination’s organizer has invited an indigenous Tsou artist to create three huge LED wild boar lanterns. That’s because this is the Year of the Pig according to the Chinese zodiac. The tallest of the boar lanterns is six meters tall. 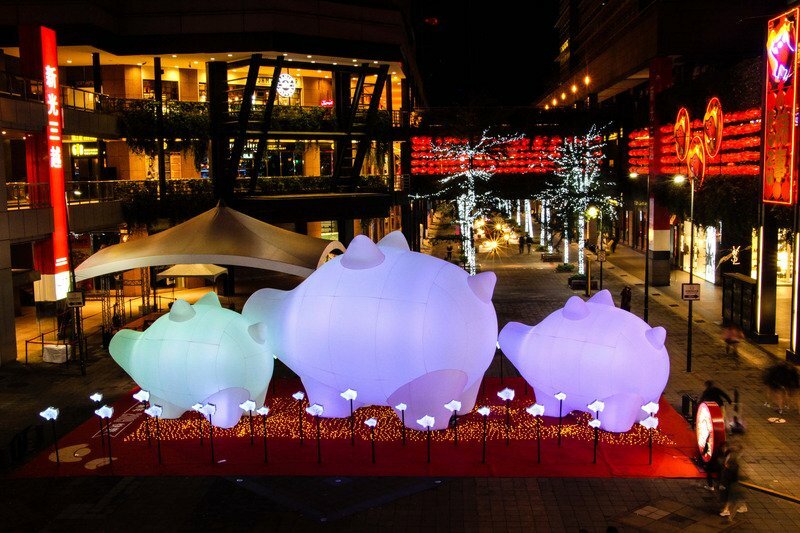 At night, the LED lights on the boar lanterns move in time with music. In addition, 62 celebrities, artists, and illustrators have been invited to design and autograph smaller pig shaped lanterns and posters. After the display wraps up in Taipei, it will head down to Taichung in central Taiwan and to the southern port city of Kaohsiung. Once the display finishes its tour, all the pig lanterns will be auctioned online with the proceeds going to charity.